I have a soft spot for heart hotel breakfasts but when it comes to QQland, it has always been one pathetic disappointment after another. The offering at the buffet table has always been a sad story. As some of you know, I have recently checked into a hotel in Da Hu for an extended stay until my roommate's family heads back to the US at the end of the month. So this morning, out of curiosity, I decided to head down to the cafe and check out the breakfast for the first time. No surprises as I was yet again, sorely disappointed. 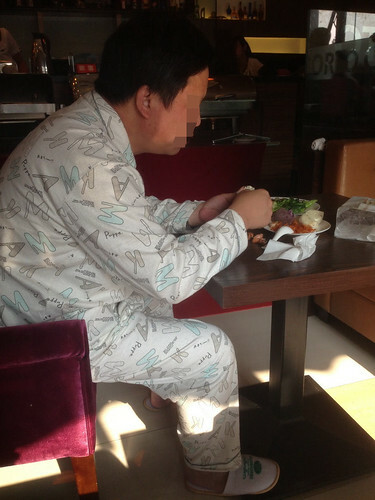 The highlight of the breakfast earlier in the morning however, was this champion uncle seated next to me in full pyjama garb. We know of Aunties plying the wet markets in their PJs, but this uncle here wins first prize. Anyway, I am not heading back for breakfast ever again unless I am locked in due to storm, hail and/or avalanche.